We’d love your help. Let us know what’s wrong with this preview of My Problem with Doors by Scott D. Southard. To ask other readers questions about My Problem with Doors, please sign up. This book pulls you in, I was constantly wondering where Jacob would end up next. Once I started reading it, I couldn't put it down and read it in one sitting. You wake up with a scream, frantically scanning your surroundings, looking for proof that the world you just narrowly escaped was only a figment of your vivid subconscious. How many times have you emerged from a life-like nightmare only to realize that it would be great fodder for a book? Lansing-based author Scott D. Southard’s new novel “My Problem with Doors” began forming in his mind when he experienced a unique and horrifying dream: “I was at home and walked through a door and ended up in a You wake up with a scream, frantically scanning your surroundings, looking for proof that the world you just narrowly escaped was only a figment of your vivid subconscious. How many times have you emerged from a life-like nightmare only to realize that it would be great fodder for a book? Lansing-based author Scott D. Southard’s new novel “My Problem with Doors” began forming in his mind when he experienced a unique and horrifying dream: “I was at home and walked through a door and ended up in another’s house in another time. I remember that fear of the realization and the shock and depression of knowing that I couldn’t go back to the life I had left behind.” Southard saw his vision through to create a big and entertaining story. It all began when our hero was quite young, barely old enough to reach the knob of his nursery’s door. He stood on tip-toe and clumsily pushed it open, only to find himself transported to late 19th century British-occupied Cape Town, where he was brought up by a kindly lieutenant before being transported once again some years later. Of course, there are certain exceptions to his condition. Not every door will transport Jacob to a new time and place. In fact, only about 1 in 20 offers passage of this kind; it’s all in the luck of the draw. The author set out to create a work of fiction that could not be neatly categorized as a single genre or for a single audience. “I felt if I created something that fit many modes, not only would it have something for everyone, but it also will be that much more unpredictable and surprising,” says Southard. He hopes that the book’s crossover into sci-fi, action-adventure, historical fiction, martial arts and romance will offer something for most readers. Reading through it, I have become convinced that “My Problem with Doors” lends itself very well to young male readers—an often under-approached readership. Adolescent and young adult boys will love living vicariously through Jacob as he uses his wit and battle skills to conquer foes, commandeer a pirate ship and even fall in love. Through a yearning for adventure, these readers will also learn a bit of history and be compelled to contemplate the deeper meaning that exists within the story’s action-packed pages. Jacob is a “man looking for meaning in his plea, he is calling to a maker for guidance”, Southard explains; “the voice and the hope in it changes, it begins as a plea, it turns into a confessional and, by the end, it is almost a journal or philosophical introspection for Jacob.” Though he did not set out to write a humanist work, the end product’s themes resonate in this way with the author, who cites Joseph Campbell, Kurt Vonnegut and Joss Whedon as influences. 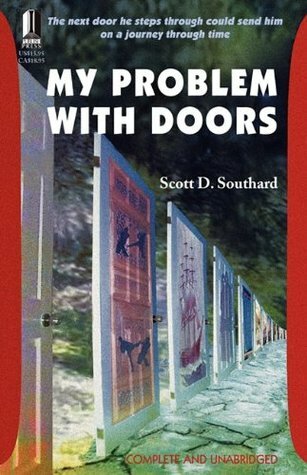 If you’d like to learn more about “My Problem with Doors” or other works by Scott D. Southard, you can visit him on Twitter, Facebook or on his Amazon.com author’s page. Jacob has a problem with doors. From time to time, when he walks through one, his life changes in a flash, transporting him across time and space, interrupting the flow of a normal life with the juxtaposition of extraordinary characters and challenging experiences. Just as he gets used to one life, one period in history, just as he builds relationships that are meaningful to him, so is he snatched away by some mysterious hand of... Well, of what? Of fate? Of God? It's a really interesting premise Jacob has a problem with doors. From time to time, when he walks through one, his life changes in a flash, transporting him across time and space, interrupting the flow of a normal life with the juxtaposition of extraordinary characters and challenging experiences. Just as he gets used to one life, one period in history, just as he builds relationships that are meaningful to him, so is he snatched away by some mysterious hand of... Well, of what? Of fate? Of God? It's a really interesting premise for a novel, that of a wanderer through time whose destiny and purpose is uncertain. He encounters somebodies and nobodies, revealing the truth behind some of the most notorious characters in history, and the smaller but no less significant stories of every day individuals. Indeed, in some senses this is a novel of two halves. While it begins as a narrative romp through history, told by Jacob himself who is scratching out his memoirs a candle at a time, it becomes increasingly a reflective existential analysis. What is the point of all this diversity of experience if I can't change anything about my own life, let alone anyone else's? And therein lies the novel's strength and, for me, its weakness. There is a richness of imagination in Southard's telling of Jacob's tale, of the places he sees, the events he witnesses, the characters he meets and falls in love and in hate with, is helped and hindered by. He witnesses some extraordinary periods in history and it would be a remarkable novel if that were what it chose to focus on as story-telling and imaginative odyssey, contrasting the values, people, places, morals, the continuity of human emotion and experience and the differences. And there is some fine, well-constructed story-telling, particularly the sections featuring the Shelleys and Byron, though less so those with Jack the Ripper. There are though some contrivances around Jacob's increasing desire to explain why he is enduring this journey, including his desire to change the course of one particular event in recent American history which feels a little unnatural in the course of the novel. There are so many events in the history of the nation, and given that we are never really sure of Jacob's nationality for he is not explicitly, patriotically American but rather a citizen of time and space, why does he choose to focus on that event rather than the Holocaust, for example, as a means of finding out whether his ability to move in time could change the course of history? This is the story of Jacob, who has a "condition": whenever he walks through a door (well, one in about twenty), he finds himself somewhere else in time and place on the other side. He doesn't know why and does his best to survive. I found the story original and interesting. Although it's not the kind of book I'm likely to re-read and it didn't exactly move me to my core, it was an enjoyable read. I easily "fell" into the book and was always wondering what was going to happen next, where Jacob would end up, if he would ever find an explanation for his problem... The historic details are also really interesting. Jacob was well written as a character, while still being just mysterious enough. The author has a good style. The only thing I'm not fond of was the use of calligrams or "shape writing" throughout the book... I didn't see the point. All in all, I would most definitely recommend this book!